Nepal Rastra Bank (NRB) is the Central Bank of Nepal. Under the Nepal Rastra Bank Act, 1955, it was established to discharge the central banking responsibilities including guiding the development of the embryonic domestic financial sector. Nepal Rastra Bank formulates necessary monetary and foreign exchange policies to maintain the stability in price and consolidate the balance of payments for sustainable development of the economy of Nepal. Nepal Rastra Bank develops a secure, healthy and efficient system of payments. It also makes appropriate supervision of the banking and financial system in order to maintain its stability and foster its healthy development. It enhances public confidence in Nepal’s entire banking and financial system. The vision of Nepal Rastra Bank is to become a modern, dynamic, credible and effective Central Bank. The main mission of Nepal Rastra Bank is to maintain macroeconomic stability through sound and effective monetary, foreign exchange and financial sector policies. The foreign exchange rate is the mechanism by which the currency of one country gets converted into the currency of another country. The conversion rate of the currency is determined by Nepal Rastra Bank as it deals with the foreign exchange. Only Nepal Rastra Bank has the authority of determining the foreign exchange rate in Nepal as it is the central bank of Nepal. Step 1: In order to see or check the Nepal Rastra Bank foreign exchange rate you need to visit this link https://www.nrb.org.np/. After clicking in this link you are then directed to the official page of Nepal Rastra Bank. Step 2: As seen in the picture here you can see the foreign exchange rate at the top right side of the page. There are exchange rates of some countries. You can also see More… Options click on the more button or click on this link https://nrb.org.np/fxmexchangerate.php?YY=&&MM=&&DD= to check rates of other countries. Step 4: After clicking on the button or the link you will be directed to the foreign exchange rate. You can see the exchange rate according to the date. You can also see the buying and selling rate by the Rastra Bank. 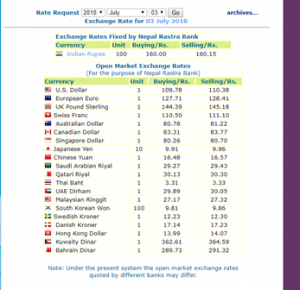 The exchange rate is changing from time to time so in order to know the current exchange rate, you need to refresh this link which shows the current exchange rate. Step 5: In this page, there?is an option of archives which is the link that directs you to change of rate of buying and selling foreign currencies of companies. Click on the archives button then it will direct you to another page. Here you can see the change in the buying and selling price of currencies. By changing the date and clicking on the button show it will show the change in the selling and buy price of currencies of different countries in those days you mentioned and it calculates the average rate. It helps you to understand the change in the exchange rate of different countries. Nepal Rastra Bank (NRB) also monitors each and every bank of Nepal. You can also see the?top 10 Nepal Banks with Contact details Interest rates. Nepal Rastra Bank (NRB) also monitors payment gateways of Nepal like?Esewa.